PG-ENC-FC-33-4 4 30" 30" 38"
PG-ENC-FC-33-6 6 30" 30" 53"
PG-ENC-FC-33-8 8 30" 30" 70"
PG-ENC-FC-33-9 9 44" 30" 53"
PG-ENC-FC-33-12 12 44" 30" 68"
When storing compressed gas cylinders, it's important to see that they are properly stored so as to prevent accidentally tipping the cylinders over and risking that a valve head get knocked off the cylinder. Such an occurrence turns the cylinder into a projectile much like a missile - it will be propelled by the escaping compressed gas and can become a very dangerous object. Serious injuries have been incurred by such situations. Protect your facility and your workers. 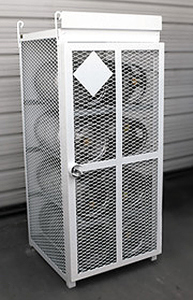 Keep gas cylinders safely stored in appropriate security cages.